The Accessible Vertical Press provides amateurs, experienced users, and people with disabilities with a workout that strengthens muscles in the shoulders, laterals, and chest. The back-to-back design allows two users to work together, including fitness park attendees that utilize mobility devices. Users on the standard side sit on the comfortable nylon saddle style seat, brace against the ergonomic backrest, and reach up to the press's handles. In a slow controlled manner, users push the press bar outward and upward against the variable resistance of the advanced isokinetic spring resistance module to workout the upper body. The resistance mechanism is enclosed to protect from vandalism, weather and moisture, and to protect against crush or shear hazards. 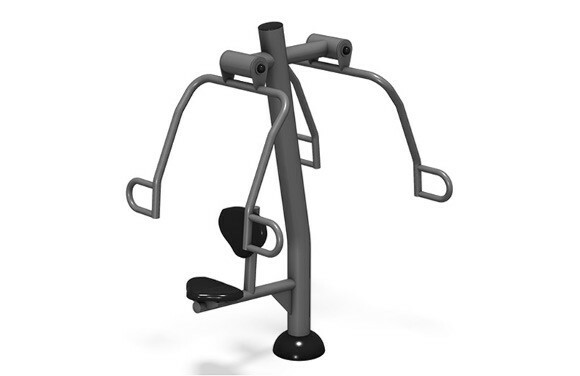 The Accessible Vertical Press is constructed from galvanized steel tubing that is covered with a rust-resistant powder-coating in black and metallic colors that resemble typical indoor gym equipment. It comes backed by an industry leading 10-year warranty on steel posts, bars, metal accessories, and welds, a limited 5-year warranty on damper module, and a limited 2-year warranty on all dampers, plastics, and rubber parts (excludes cosmetic damage or defects).